A 12-year-old schoolboy from Elgin, Scotland named Daniel Strong has braved wintery conditions on Scotland’s Moray coast to try surfing for the first time. By itself, this might not seem particularly remarkable, but seven years ago Daniel nearly died of a brain tumor. Whilst undergoing surgery to remove the tumor Daniel developed stroke-like symptoms, causing permanent blindness in his right eye and weakness in the left-hand side of his body, which meant he had to undergo physiotherapy to learn to walk again. 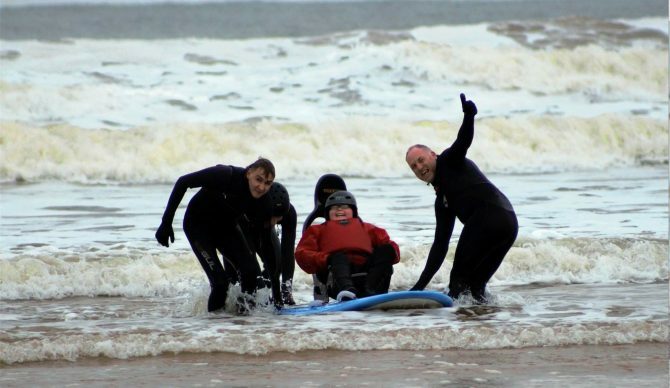 Undeterred by his physical limitations, or the cold, and aided by a specially adapted board, Daniel loved his first experience in the waves. “Going under was the best bit,” he said. He plans to be back as soon as possible. “It was always one of those things we thought he was never going to be able to do,” she said. Daniel’s first surf experience was made possible by a program called surfABLE, implemented by a charity called Friendly Access. The surfABLE program is the only adaptive surf school in Scotland. Using a board with a specially made carbon fiber chair which costs around $5,000 to produce, the charity group makes it possible for wheelchair-bound people to get into the ocean and learn to surf. The school was launched just 18 months ago, initially specializing in facilitating surf experiences for those on the Autistic spectrum. Glyn Morris, Chief Executive of Friendly Access, explains that surfing helps people with Autism to relax, develop social skills, and explore personal boundaries. “Social interaction, communication, and a holistic approach are key,” he says. The surfABLE initiative now aims to open up the surf experience to people with a broad range of mental and physical challenges. Morris says that their policy couldn’t be more inclusive. He says that they will take anyone between the ages of five to 105, who might not be able to access surfing by themselves. “I’ve yet to meet a 105 year old who wants to go surfing for the first time!” Morris added. “There is no first place in surfing,” says Morris. This makes it particularly relevant to people who have felt excluded from other sports due to the competitive element. He says that surfing, for those with autism, “takes the pressure away” from participating in sport. “There should be no barriers for people with disabilities,” says Morris. The popularity of surfABLE is growing. According to Morris, they have 42 volunteers on hand to assist the regular participants traveling the length and breadth of Scotland to ride the waves of the Moray coast. He emphasized that the surf experiences often seemed just as rewarding for the volunteers as the participants, and that the connections formed through a shared love of surfing were key. Charity groups such as this and people like Daniel serve as a good reminder of just how valuable surfing can be to a range of people, looking for a range of experiences. It puts sharply into context our daily squabbles about line-up politics, gripes about bad waves, and a million other surf-related moans. It shows us that beyond the often petty world of the experienced surfer, surfing can still be completely egalitarian, and completely rewarding.